A radar chart compares the values of three or more variables relative to a central point. It’s useful when you cannot directly compare the variables and is especially great for visualizing performance analysis or survey data. Here’s a sample radar chart, so you can see what we’re talking about. It’s likely you’ve run across them before, even if you didn’t know that’s what they were. 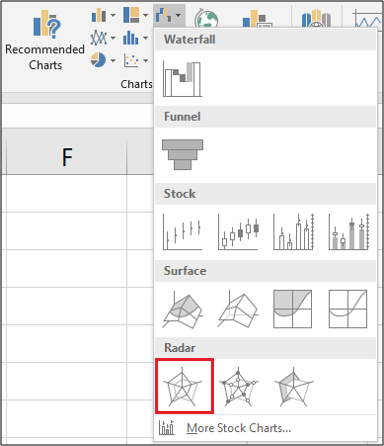 Creating Radar Charts in Excel is straightforward. 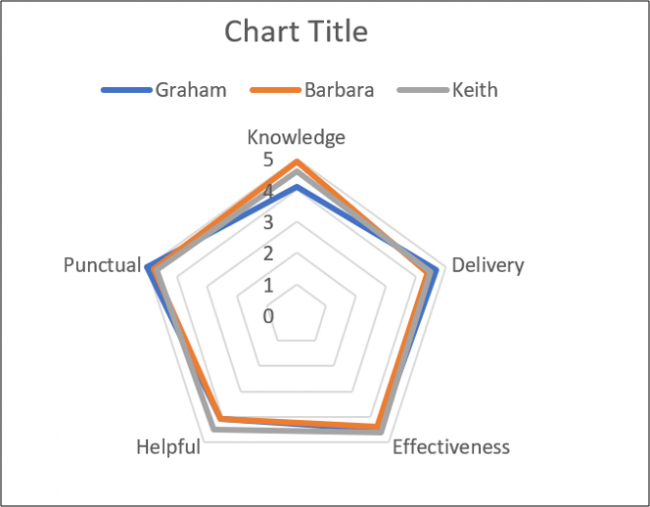 In this article, we’ll show you how to create two types of Radar Chart: a regular chart (like the one above) and a filled chart (like the one below, which fills in the areas instead of just showing the outlines). Let’s first take a look at the sample data we’ll be using for our examples. We have three trainers: Graham, Barbara, and Keith. We’ve assessed them in five different categories (Knowledge, Delivery, and so on) and our Excel table contains those ratings. Select all the cells, including the row that contains the names and the column that contains the assessment titles. 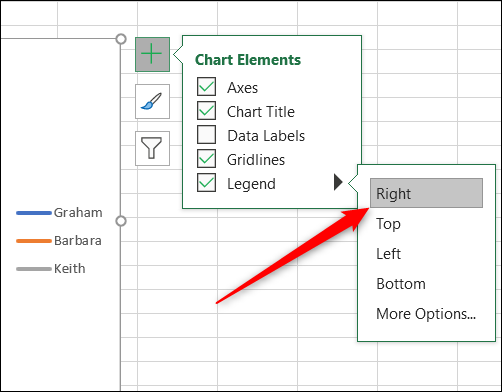 Switch to the “Insert” tab and then click the “Waterfall Chart” button. Now that you’ve inserted the chart into the worksheet, you can begin to make some improvements to it. Select the chart title and then type a new title. As you type, the text will appear in the Formula Bar. When you press Enter, your chart will have a new title. For another change, we could move the legend from above the chart to the right. When the chart is selected, you’ll see four buttons hovering at its top right. Click the “Chart Elements” button at the top, and then hover your mouse over the “Legend” option. You’ll see an arrow to the right. Click that and then click the “Right” option on the menu that appears. To give our Radar chart a greater impact, and more data clarity, we will modify the axis to begin at three instead of zero. 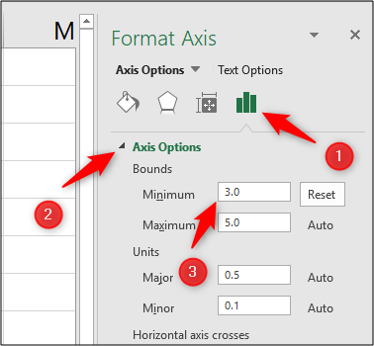 The Format Axis pane appears on the right. We want to edit the “Minimum” setting under the “Bounds” section, so click that field and type “3” there. 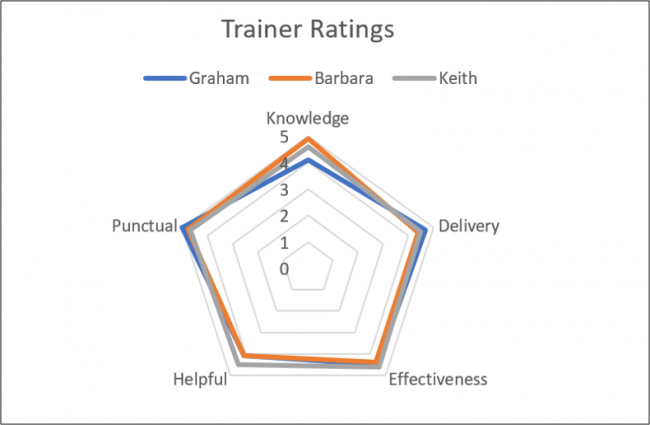 The radar chart updates immediately and now that we’ve increased the minimum Bounds value, you can more clearly see the differences in the assessments of the three trainers. This example gives us a nice view of which trainers excel at which qualities, and also how rounded their skill sets are. For a second example, we will create a filled radar chart for just one of the trainers. We will use Keith for this example. First, select the range of cells that you need. In our example, we want the range A1:A6 and the range D1:D6 as shown below. To do this, hold the Ctrl key while you select each additional cell you want to add to your selection. Now head to Insert > Waterfall Chart > Filled Radar. When you create a radar chart using only one data series, the axis does not start from zero the way it did in our previous example. Instead, the minimum bound will be the lowest number in the range of cells you selected. In our case, the minimum bound is 4.4—one tick below Keith’s minimum score. 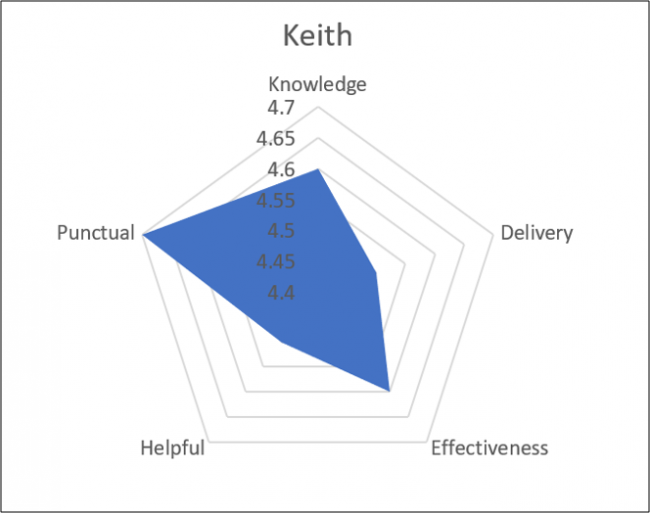 This chart helps you visualize how strong Keith is in each of the assessed qualities. Note that if we were creating more than one radar chart (like, say, we wanted to show a separate chart for each of our trainers), we would want to make sure the axis ranges are consistent so that the data presentation is not misleading. So, for example, we would set the minimum bound to be a bit below the lowest ranking of any trainer and the maximum bound to be a bit higher than the highest ranking of any trainer. You could even remove the axis itself to reduce clutter on the chart. 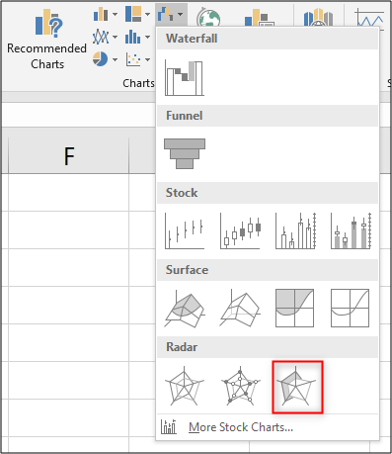 Creating radar charts in Excel is simple, but getting the most out of them can require some extra attention. They can be a useful addition to your Excel reports in the future.